Liczba stron: 363 Jest to ujednolicona liczba stron, która ułatwi Ci porównanie długości książek. Każda strona Legimi to 200 słów. A dead Baron. A missing emerald. And way too many suspects.Amateur sleuth Molly Sutton has her hands full this time! Shut out of Castillac’s latest murder case and running out of money, she’s praying for a brilliant scheme or at least some dumb luck to strike. Believing good food can be the solution to almost any problem, she comes up with a culinary idea designed to stave off financial disaster—and finds that even a perfect meal can end up a flop.As for the poor late Baron, once Molly manages to get inside the Château, she quickly pokes her nose where it doesn’t belong. But looking for clues and uncovering secrets is a risky business, and this time Molly ends up with her own life in danger.The Château Murder is the fifth book in the Molly Sutton Mystery series. If you like page-turning mysteries that keep you guessing, a small town setting filled with characters you’ll feel like you know, and pastry galore, you’ll love Nell Goddin’s latest cozy with a dash of psychological intrigue.Put the puzzle pieces together along with Molly and see if you can guess who killed Baron Marcel de Fleuray! Would you like a free short story set in Castillac? “Don’t mess about with that.” Marcel waved his hand with an effort at nonchalance but his tone had a slightly wary edge. Aimed directly at his head, the barrel of the shotgun did not budge. The barrel advanced a few steps. And then, just like that, the trigger was squeezed and the gun went off, sending a spray of birdshot straight at Baron Marcel de Fleuray. With that mysterious sense of premonition we sometimes have, in an infinitesimal fraction of a second, he felt the shot coming and turned to the side, trying to save his handsome face. The blast would likely have stung but not been fatal, had not one single pellet happened to nick his carotid artery, which was exposed as he turned away. Marcel slumped to the floor of the salon, which was hard stone but covered with two layers of sumptuous carpets. For a moment, speechless, he looked imploringly at the shooter, who lay the shotgun on an antique console table and meticulously wiped it clean of prints. By the time that was done, the Baron had expired, and his murderer calmly went out through the open door and into the chilly darkness of a brisk October night. The two-persongendarmerie of Castillac was struggling to get its footing after a series of personnel changes. Gilles Maron was still acting Chief, though unhappy in the job, partly because he strongly disliked the other officer. He found the snobby Paul-Henri to be insufferable, and organized their duties so as to spend as little time with him as possible. So on the morning of October 19th, Maron was making the rounds of the village alone, keeping his eye on the various businesses and chatting with residents, just as the former Chief Ben Dufort had taught him to do. Maron was not naturally easy-going or sociable. But he wanted to do his job well, and every morning he walked the perimeter of the main village and by continuing in smaller circles eventually made it to the Place in the center of Castillac, greeting people as he went, and trying to see under the surface in case someone was in trouble but struggling to ask for help. Things had been lately, and a yearning for a more urban posting kept swimming into his thoughts. He liked to imagine himself in a bullet-proof vest, storming into a terrorist enclave on the outskirts of Paris, performing dangerous, important work—anything but monitoring this sleepy village where everyone knew everyone else’s business and the main topic of conversation was what you planned to eat at your next meal. Though no one could really call Castillac sleepy, not anymore. The villagers joked that it had turned into the French version of Cabot Cove, with another murder every time you turned around. Like all the best jokes, it came lined with a streak of truth and discomfort, and some didn’t find it respectful, or prudent, to make light of such serious and unfortunate events. It was a warm morning, with none of the chill of the past week. The terrace of the Café de la Place was filled with customers, most of whom Maron recognized. It was rather a loud group for mid-morning, he thought as he approached. “Bonjour, Maron!” shouted Pascal, the young and very handsome server. Maron nodded though he had no idea who Pascal was talking about. “Babette said Georgina told her that she found the Baron dead in the salon! Shot to death!” Pascal could not contain his excitement at the news but tried and failed to look appropriately sorrowful. “Yes, yes, the Baron de Fleuray—I am not surprised if you’ve never met him. He didn’t spend much time in Castillac, I don’t think. And when he was here, he…well, I don’t know what he did with himself, but he wasn’t hanging around with the plebes here at the Café, I can tell you that!” Pascal laughed, tipping his head back and showing his straight white teeth. Maron was nodding, his mind racing. With relief he thought: hunting accident! And then realized that was fairly unlikely to have occurred in his salon. Possibly something happened while he was cleaning his gun? “Have you seen Georgina?” he asked. Maron nodded. He was no great fan of the aristocracy himself, having come from a working class family in the north of France who talked reverently about the part their ancestors had played during the Revolution. “All right then, thank you for the information,” he said stiffly, and took off for the station. Not for the first time he wished Ben Dufort was still the Chief. He would know how to talk to the people out at the Château. Maron jammed his hands into his pockets as he walked, brow furrowed, planning out the first steps in the new investigation. “Bonjour, Paul-Henri,” he said, entering the station. “Let’s get to the Château, shall we?” said Maron. Paul-Henri opened his mouth to answer but changed his mind. It was difficult having a boss who understood so little about how the world worked, but he had learned that Maron did not listen when he tried to explain, so he pursed his lips while delivering a short lecture inside his head as they drove out to Château Marainte. Molly Sutton, no longer a newly-minted expat but practically an old-timer in the village, was planting bulbs with Frances in the front yard of Molly’s house, La Baraque. They made a mismatched pair, with Molly on the short side with freckles and unkempt red hair, and Frances slender and elegant, her red lipstick flawless. The two had been best friends forever. “You have to dig deeper, Franny,” Molly said, looking down at what Frances was doing. “Really?” teased Molly. They continued to dig in companionable silence for several minutes. Molly was thinking that she had been living in Castillac for over a year, and all in all, the move had turned out better than she’d ever dreamed. Her gîte business was…well, finances were perhaps a bit shaky as she headed into the off-season, but bills were mostly paid and she had some bookings over the next few months. She loved France unabashedly, and her adopted village of Castillac even more. “So how are the wedding plans going?” Molly asked. Frances had come for a visit that winter, and ended up loving not only French village life but the bartender at their favorite bistro. She and Nico were talking about getting married though no date had been set. “So what’s your angle gonna be, then?” asked Frances with a grin. The women walked arm in arm back to the house, Frances missing Nico even though she’d seen him only three hours earlier. Molly wondered about her ex-husband, and whether this theory explained why that marriage had failed. Had she missed seeing who he really was until it was too late? People are mysteries, that’s all there is to it, she concluded as she opened the bag of almond croissants bought that morning at the beloved Patisserie Bujold, breathing in the buttery, almondy aroma and grinning in anticipation. Long before they reached it, the officers could see the imposing Château Marainte looming up before them, a red flag flying from a turret on the east end of the building. The 13th century edifice stood on a hill surrounded by farmland, visible for many kilometers in nearly all directions. Maron turned into the drive, which wound up the hill through a wood and then straightened into an allée lined with two hundred year old plane trees. Paul-Henri nodded, his jaw working. They pulled into a white-graveled parking area and got out. The Château, a defensive building with slits for archers and two crenellated towers, was not in his favorite style. He much preferred the more delicate and artful architecture of later centuries such as the chateaux at Chambord or Challain. He rubbed a spot on one of the buttons of his uniform while waiting for Maron to decide what to do next. Maron was looking at the vast building with his mouth open. The stone was dark and the place felt unfriendly to him. A wooden bridge crossed a dry moat and he set off that way, wondering if the Baroness was waiting for them inside, and what kind of person she would turn out to be. The officers went through an immense gate and into a large courtyard planted with parterres outlined in boxwood, with an old well in the center, closed in on all four sides by the gray walls of the Château, five stories high. They turned to see a middle-aged woman coming towards them, dressed in a long wool skirt and a velvet blazer. Paul-Henri had been about to speak but whatever it was, he choked it back. “I must have spoken to one of you when I called. Marcel…my husband Marcel…has been shot.” She held out a palm and bowed her head, taking a moment to collect herself. “It’s quite horrible,” she said, almost too quietly to hear. “Can you show us where he is?” asked Maron, unsure how to behave, having had no experience around aristocrats and feeling pretty sure there were rules and protocols for what to say and how to say it, even if you were a gendarme. Maron nodded, having never seen an aristocrat’s man-cave but figuring the concept was the same. The Baroness pushed on the door and the three of them stepped into the dimly-lit room. Old tapestries covered the stone walls and a table lamp with a green shade pooled light on an antique desk. On the walls hung various hunting trophies—antelope and deer heads, a leopard skin, the impressive twirling horns of a kudu. An enormous fireplace held ashes and a few charred logs but no fire was lit. Looking around, Maron noticed the shotgun on the console table, and when he moved farther into the room he saw the Baron, lying in a pool of dark blood on a Turkish carpet. Paul-Henri gasped and then tried to pretend he was coughing. “I’m very sorry for your loss,” said Maron to the Baroness, who inclined her head slightly and thanked him. Maron tilted his head inquiringly. “Oh, I just mean that she likes a bit of drama. You know how people are.” She looked over at her husband and Maron saw tears spring to her eyes. “Hubert Arnaud. And oh of course, certainly he hunts. I don’t know what kind of arrangement Marcel had with him about using our land for his own hunting, but he…are you thinking that the shotgun is the murder weapon?” she asked, her voice rising as she gestured at the Holland & Holland lying on the console table. “Don’t touch it!” barked Maron. “It will need to be dusted for fingerprints. There is some chance that another gun was used, and the coroner will have the final say—but I would guess, looking at your husband, that this gun was…the gun that killed him. Shotguns aren’t the most efficient way to go about killing someone,” he muttered, and then looked up to see that the Baroness was staring at him aghast. Antoinette nodded. “Made for killing birds,” she said, a bit harshly. A border collie ran into the room and eyed Maron suspiciously. “It’s all right, Grizou,” Antoinette said to the dog, reaching down to scratch behind his ears. The Baroness’s face relaxed for the first time since Maron had met her, and he had a fleeting glimpse of what she had looked like as a young woman. She’s so polite, Maron was thinking. He had thought aristocrats were imperious and went around with their noses in the air, but here is Antoinette, not the least bit haughty and asking to be called by her first name, and doing her best to be helpful in what must be the most shattering time of her life. He was trying to put her in a category and failing. “But of course,” he answered, gesturing to the door. “Grizou!” called Antoinette, and the dog shot through the door and into the sunny courtyard. Florian Nagrand, the coroner, was just making his way into the courtyard, flanked by several forensics men who had made it from Bergerac in record time. “Just sitting down to lunch,” growled Nagrand to Maron, and the Baroness burst into tears. Alexandre Roulier stretched out on the hotel bed and put his hands behind his head, trying to think. He had just received a call confirming Marcel’s death and he knew that his next moves were critically important. One false step and Antoinette might bar him from the Château altogether, or worse, sic the gendarmes on him. He had to think though the details carefully, painstakingly. The hotel was a solid two-star in an outer arrondissement of Paris. Hardly shabby—and the concierge was a pretty young woman, the breakfast better than average, the view from his window decent enough. But Roulier was not content with two-star. He wanted to be at the Georges V, the Shangri-La, the Ritz. He wanted to have so much money that he never had to look at a price tag or comparison shop ever again. And once he had his riches, he had a few ideas about changing his last name to something with a bit more sparkle—“Roulier” referred to someone using a cart, a distinctly working-class name—but after losing a half hour daydreaming of more elegant possibilities, he sternly told himself to stick to the matter at hand and not get ahead of himself. Alexandre was nothing if not disciplined. First thing is to take the train down to Castillac, just as he had numerous times with Marcel. He could comfort Antoinette in her time of grief. He could enjoy one last stay at Château Marainte, perhaps even get in a day of boar hunting. And he could finally, with Marcel out of the picture, search for the box. Alexandre had never had a chance to search Marcel’s Paris apartment, but he very much doubted it was there. For all his worldliness, Marcel had a sentimental streak, and Alexandre would bet his little finger that Marcel had hidden the box somewhere at Château Marainte, his boyhood home and that of his ancestors going back nearly four hundred years. Alexandre liked to get up at dawn, finding that he did his best planning early in the morning. He enjoyed a long shower, spending a few moments regretting how small the stall was, and tiled in porcelain instead of marble. He was careful to dress in his most casual clothing, knowing that Antoinette would disapprove of his customary Parisian finery. It was critically important to have her on his side, and as he packed a small bag he came up with a few ideas for winning her over; it was a delicate thing, as the Baroness, though provincial and overly attached to her dogs, was quite perceptive and apt to be on her guard now that she was a widow. He would need to figure out how to get Antoinette out of the way while he searched, and there might be others in the household who would need to be persuaded to look the other way. But this gave him little worry since he had yet to meet the housekeeper who was not open to a juicy bribe. The one thing causing him anxiety was that he had no idea whether the existence of the box and its contents was widely known. Was Château Marainte going to be crawling with charlatans hoping to grab it? Or were the stories Marcel had told him over brandy late at night been actual confidences? 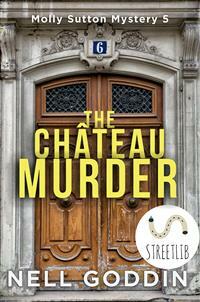 Alexandre could think of no way of knowing except to show up at the Château and assess the situation. Perhaps Antoinette did not even know about the box. Certainly that would make the operation easier, he thought, allowing himself to imagine finally holding the box in his hand with no one else around, no one to impinge on the rapture, the rapacious pleasure of holding that much money in the palm of his hand. The box itself was elaborately decorated in jewels—or so Marcel had told him—but the emerald it contained was the real treasure. All that remained was breakfast, and then to the train. Florian Nagrand had been the coroner in Castillac for twenty-six years, during which he had driven his white van to pick up around thirty bodies a year, give or take, the vast majority of whom had died of natural causes; taken countless photographs; smoked an infinite number of cigarettes; and consulted with a long list of gendarmes as they arrived in Castillac and then were posted elsewhere a few years later. At this point, a routine death by shotgun was nowhere near interesting enough to spark his curiosity, no matter that it was murder and not an accident, and had apparently taken place in a salon at Château Marainte. “No chance the body was moved? He was definitely shot right here in the salon?” asked Maron, squatting down next to the body. “It’s possible,” said Nagrand, who never liked being pinned down about anything, even on what he would like to have for dinner. “That’s because you’re a foul slob,” said his workmate with a wide grin. Maron got up and walked to the other end of the room, careful to watch where he put his feet. “If this is where the Baron spent a lot of time, then yes, he appears to have been orderly in his habits. I will inquire about the housekeeper’s activities. All right then, I’m going to leave you guys to it. Anything comes in from the lab, you know how to reach me. Paul-Henri, you stay here in case the guys need you.” Maron patted his cell and went back outside to the courtyard. Antoinette was kneeling beside one of the parterres, pulling some weeds, no longer crying. “I understand,” said Maron, though he did not. He looked around at the dark gray walls of the Château, five stories high. Instead of feeling protected there in the courtyard it felt suffocating, even though he was standing in the sunshine and could feel a light breeze. Antoinette cocked her head. “Let me think. Georgina and her husband live in a cottage partway down the hill—you passed it when you drove in. I have no idea whether he was home last night or not. Hubert lives about four kilometers away, between the Château and Castillac. Or do you mean right here, inside the gates of Château Marainte?” Antoinette paused and looked at Maron. He looked into her hazel eyes. For a brief moment he had an urge to brush a stray strand of blonde hair out of her face. Hearing his name, Grizou got up from a shady spot under a miniature peach tree and trotted to Antoinette’s side. “Well, I suppose it’s like anything else. It ebbs and flows. To be very honest, since that is obviously what is required, we did not have much interest in each other anymore. We knew each other as children, you see. Grew up together, raised a family, a lot of years went by. And so at a certain point it was as though all the feeling that could be wrung from sentiment had been gotten, you understand, and there was just not much of anything left. In a bad way, thought Maron, but kept the thought to himself. It was Saturday morning, market day, and Molly was out of coffee. She dressed haphazardly, raked a comb through her tangle of red curls, fed Bobo, and zipped into the village on her scooter, planning to spend the first half hour at Patisserie Bujold getting her caffeine fix and feasting on the freshest and best pastry in the entire département. The air was chilly at eight in the morning. Leaves were turning color and summer gardens drooping, the sight of which always left Molly feeling melancholy. The problem with October was that the whiff of death was up in your face every time you went outside. “Bonjour, Molly!” boomed Monsieur Nugent from behind the counter as he packed a box of pastries for an older woman at the front of the line. “Bonjour, Edmond,” said Molly with a wave. She walked over to the case and looked over the day’s selection, always a wide variety on market day. As usual, the rows of delicacies were perfectly neat with not a crumb out of place. Cream puffs, Napoléons, réligiueses, palmiers, éclairs, apricot tarts…impossible to decide. “How are you?” asked Molly when it was her turn. “What does the doctor say?” Molly said, ignoring his glance. Molly paid and moved to let the throng behind her have a turn, and since the tables were full, she walked back to the Place where the market stalls were set up, sipping coffee and nibbling a croissant along the way. When she first moved to France a little over a year ago, market day had been both thrilling and intimidating. So many things she had never seen back in Boston: a fellow walking around with vials of vanilla beans attached to his clothing, selling them for four euros a pop; an old man sitting at a card table selling walnuts he had gathered in his yard; more varieties of cheese than seemed humanly possible. But Molly was not satisfied just being an observer—she wanted to be in the thick of it, laughing and talking to everyone. Which she managed, in time, but those first few months had been a bit like jumping off the high dive and belly-flopping over and over, since her language skills were pretty dismal. But that was then. As with many pursuits, a willingness to make mistakes leads to fast progress, and a year later Molly would still not have said she was fluent, though she really was. She understood jokes most of the time, and could almost always find a way to say what she meant and understand what someone was saying to her. “Molly!” called her friend Manette, who presided over a vast array of vegetables, both imported and grown locally. “Eh, you’ll find a way. Well, look who it is…” said Manette, still whispering. Molly whirled around to see a slender woman dressed in a quietly smart wool suit, wearing an expensive pair of leather boots. Molly stood with her eyes wide and her ears open, hoping Manette would introduce her, but after talking a minute more, the Baroness bought an eggplant and four potatoes, waved goodbye, and moved back into the throng in the center of the Place. “Well, not really,” Molly answered, scowling. “Besides, I thought all the aristocrats got the guillotine,” she added under her breath. Molly kissed Manette goodbye and tried to think about what to make for dinner. Sausages and sauerkraut? With a dry cider? “La Bombe!” called out a familiar voice. “Good morning, Lapin,” said Molly, stopping to let the big man dodge through the crowd to catch up to her. They kissed cheeks and exchanged how-are-yous. Market day took three times as long now that Molly had so many friends in the village. “I knew you’d know valuable information when you heard it,” said Lapin with satisfaction.